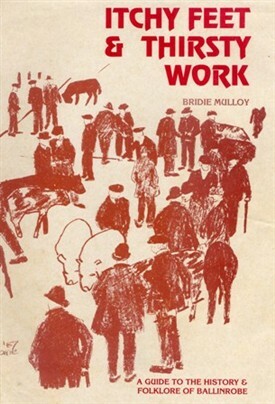 Cover of "Itchy Feet & Thirsty Work"
Bridie who lived in Ballinrobe was a native of Ballindoon, County Sligo. 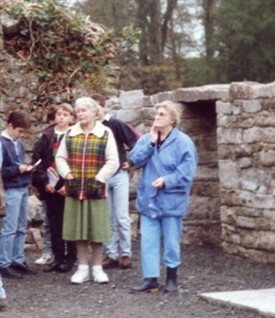 Her late husband, Tony d. 2008, was Principal of Ballinrobe Vocational School until his retirement in 1981. He acted in a voluntary capacity as Secretary of the Ballinrobe Racecourse Committee for some time in the 80s. 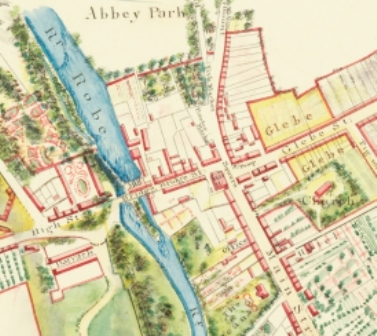 Bridie became interested in folklore and the results of her research in Sligo, Mayo and Waterford are contained in 21 manuscripts in the Irish Folklore Department in University College, Dublin. 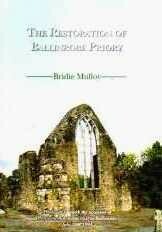 In 1963 Bridie was offered a position as Irish Farm Guesthouse Advisor and this entailed travelling all over Ireland for three years. She has been described as the pioneer of the farm guesthouse movement. Bridie became a regular contributor to local and national newspapers and magazines when she took up journalism as a hobby. Her contributions including projects for the Farmer’s Journal, Woman’s Way, and the Irish Countrywoman, in the 1950’s and ‘60’s. Her monologues have featured on RTE and Mid-West Radio. Her book, ‘Itchy Feet and Thirsty Work’ is a social history of the Ballinrobe area and her meticulously researched history of Ballinrobe’s Augustinian Abbey, in conjunction with the Lough Mask and Lough Carra Tourist Development Association and FÁS, was marked by the visit of President Mary Robinson to Ballinrobe on July 28, 1994. Bridie died on 10th October 2009 and her body, like her husband’s Tony was donated for Medical Research. This page was added by Averil Staunton on 10/07/2011. Niall O'Dowd to visit Ballinrobe.